Mom Taxi Julie: I Love Fridays! It's Friday It's Friday!! WOOT WOOT!! That was a long 3 day work week if that's possible. Loved filling out my two week time card today though with all those paid holidays in there. I am truly spoiled at my job and definitely do not take it for granted (see getting laid off lol). I really had to draggg myself out of bed today. So tired. Yesterday I wasn't feeling 100% so I'm not sure if I had a bit of a bug or what. Maybe it's the detox from the Diet Coke? I don't drink THAT much every day but I do have at least one a day usually. This is day FOUR with none. I'm going to the bar tonight with some of my book club ladies so I'll have to come up with something new to drink. Kind of sad but I don't even have to tell the bartender my drink usually. I'm going to throw them for a loop! We just finished dinner. I made the Turkey Black Bean Enchiladas from Skinnytaste (all my recipes this week are from there). Sometimes I feel so stupid when I make recipes. Today I first of all forgot that I had double the ground turkey and had to scoop half of that out after I had added some of the other ingredients. I also put the chicken broth in with the meat mixture instead of the sauce mixture AND put the whole can in. DOH. I realized what I had done and poured some of the liquid from the meat mixture into the saucepan. Eh, turned out ok! I didn't use the chilies in adobo sauce. I bought those before for one of her other recipes and they kind of grossed me out (yes I'm weird) so I just left them out. It was still plenty spicy enough for me. I still need to do my 50 side lunges for my calendar work out. 25 on each side should be good! That's all I'm doing for my exercise today. I'm hoping my knee will be able to take going for a longer run tomorrow. Cross your fingers for me! 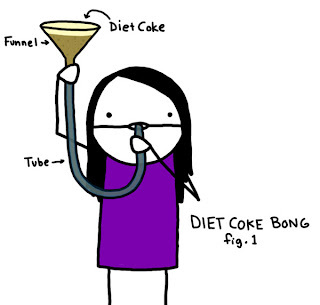 Lol...love the Diet Coke bong! You're the best! I like Saturdays even better. I am also so thankful I have never ever took to drinking pop, diet or otherwise. hate it, unless hung over. I hear it's a tough addiction to crack. Good luck on this. You've accomplished so much now I know you can do this too.